I sit quietly for hours. you make me for hours. Julie Mahfood has an MA in English & Creative Writing and has work in literary publications including Descant, Grain, Literary Review of Canada, CV2, Room, montreal serai, and Caribbean Writer. 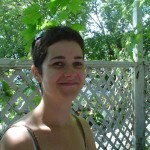 She is in Ȋle-Perrot, QC and recently completed her first novel.